The development of voice translation technologies in Kyoto Prefecture has been accelerating due to the increasing number of foreign tourists and the upcoming 2020 Tokyo Olympics. Private companies are carrying out field trials that convert Japanese speech into texts or spoken messages in foreign languages on trains and at hotels while a research institution has been working on improving translation accuracy. Their goal is to provide foreign visitors with a friendly environment where they enjoy sightseeing and shopping in Kyoto without stress. Field trials of a translation app for smart phones are scheduled to be held soon in some cars of Hankyu Railway's Kyoto Line and Keihan Railway's Uji Line, as well as in Hankyu Railway’s Kawaramachi station. The app translates Japanese spoken announcements into texts in foreign languages which are displayed on screen. The system has been developed by Yamaha, a leading musical instrument manufacturer headquartered in Hamamatsu City, Shizuoka Prefecture. It can be applied to a variety of situations, such as guidance at stations for arrivals and departures. Translated texts are displayed on screen in foreign languages, including English. It is scheduled to be put into practical use in the next fiscal year. "We would like to introduce this system for public announcements at many places, including tourist sites and commercial establishments," the Corporate Communications Division of Yamaha explained enthusiastically. Panasonic and JTB had conducted tests of an automatic translator, which is under development, until this autumn at Kyoto Hotel Okura in Nakagyo Ward, Kyoto. During the test, tablet terminals for speech translation into English, Chinese, and Korean were allocated to information desks. The system was said to be quite helpful for customer service in areas such as introducing sightseeing spots, etc. Further improvements of the system are expected, and the goal is to launch it onto the market before the 2020 Tokyo Olympics. Many of the manufacturers who are venturing to commercialize a voice translation system, such as Yamaha and Panasonic, utilize voice recognition technology developed by Universal Communication Research Institute, National Institute of Information and Communications Technology (NICT, Seika-cho, Kyoto Prefecture), located in Kansai Science City. The VoiceTra app, which translates voice messages into spoken or written ones in other languages, has been offered by NICT since 2010. The app currently supports 29 languages. This autumn, a newly revised version was released with improved translation accuracy in 10 languages, including English, Chinese, and Thai, for conversations while traveling. 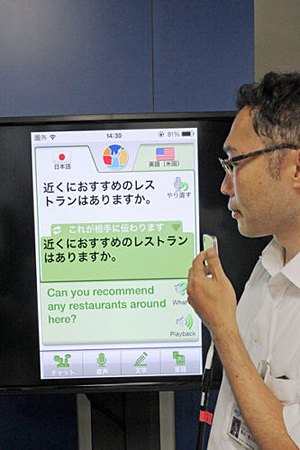 "We want to improve its translation accuracy before the 2020 Tokyo Olympics so that it can also translate spoken messages related to daily life, and health and medical care, like 'I have a stomach ache,'" said the Public Relations Department of NICT.